Note: If you have already done your registration in BRACIS'2017 and want to buy your dinner ticket now you must enter ECOS system again to do it. 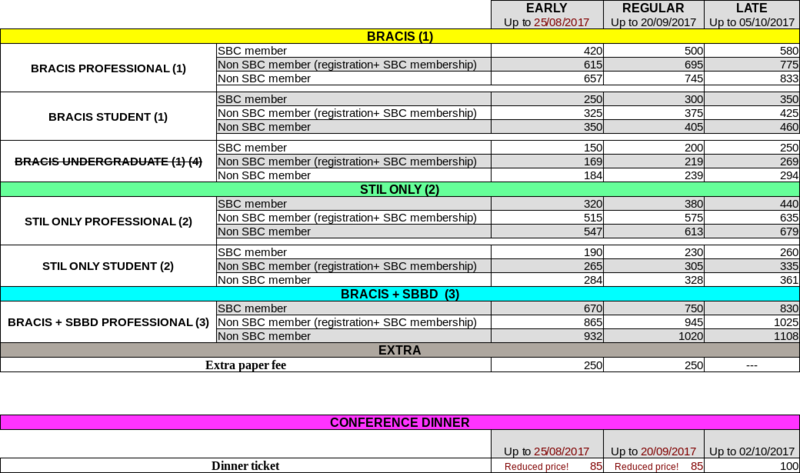 (1) BRACIS fees (PROFESSIONAL, STUDENT and UNDERGRADUATE) give access to all BRACIS'2017 conference activities (BRACIS+STIL+ENIAC) and also to the invited talks of the co-alocated event SBBD'2017 (SBBD+KDMiLe). Other SBBD'2017 exclusive activities will be restricted due to rooms' capacities. (2) STIL-ONLY fees (PROFESSIONAL and STUDENT) give access just to STIL activities, including the invited talk of STIL. (4) BRACIS Undergraduate fee is restricted to 40 participants. After this limit, undergraduate students must register under Student fee. New: This limit has been reached. Now, undergraduates must register for the STUDENT fee. Registration + SBC Membership. This category refers to a discounted rate applied when registering to the event and becoming a member of the Brazilian Computer Society (SBC). This modality was created intending to make these two benefits cheaper than purchasing each one separately, being the most advantageous option to whom is not an SBC member yet. More information can be found at the SBC's FAQ page (only in Brazilian Portuguese). Please read the FAQ about the SBC Combo (in Portuguese). Student fees are available only for students who are enrolled in a higher education institution as an undergraduate or graduate student (Ph.D or Master). Proof of student status containing affiliation, attendee's name, enrollment course, and current date must be shown upon request. Failure to present such a proof document will imply paying the difference for Professional registration category (with no discount) in case of wishing to attend the Summer School. At least one author of each paper accepted to BRACIS must be registered in Conference event as BRACIS PROFESSIONAL REGISTRATION fee by the camera-ready deadline (11th August). At least one author of each paper accepted to STIL must be registered as BRACIS PROFESSIONAL or STIL-ONLY PROFESSIONAL REGISTRATION fees by the early period (17th August). At least one author of each paper accepted to ENIAC must be registered in Conference event as BRACIS PROFESSIONAL REGISTRATION fee by the early period (25th August). Each BRACIS PROFESSIONAL REGISTRATION covers up to two accepted papers in any BRACIS'2017 event (e.g., 2 BRACIS papers, 1 BRACIS + 1 ENIAC paper, 1 ENIAC + 1 STIL paper,…). Each STIL-ONLY PROFESSIONAL REGISTRATION covers up to two accepted papers just in STIL event. Each BRACIS+SBBD PROFESSIONAL REGISTRATION covers up to two accepted papers in any BRACIS'2017 event (e.g., 2 BRACIS papers, 1 BRACIS + 1 ENIAC paper, 1 ENIAC + 1 STIL paper,…) and also complies the publication policy of SBBD'2017 conference for PROFESSIONAL FEE (see http://sbbd.org.br/2017). If you have more than 2 papers accepted in BRACIS, ENIAC and STIL, you must pay the Extra Paper Fee for each paper beyond the second. Registrations can be cancelled up to a week before the event. Only 80% of the registration fee will be returned.